Breaking Premier League News: New Liverpool Manager Could Be Roberto Martinez: Liverpool FC fans have been marred by the Kenny Dalglish era of late. However, the Reds might soon have something to smile about. Roberto Martinez, one of the hottest managers in the Premier League, could be set to take over in what amounts to be the most up to date and latest Liverpool FC news out of Anfield. It has been a frustrating few years for the Reds to say the least. They finished in 8th place on the 2011-12 Premier League table, and with just 52 points, they were actually closer to relegation than they were winning the 2012 English Premiership Championship. With just 14 wins in the EPL season, there was really not all that much doubt that Dalglish was going to be booted out of Anfield, especially after a similar sixth place finish the year before. This next season will be the second straight in which Liverpool will not be partaking in any of the European competitions. Cashing In On 90% Of Your Soccer Bets Is Easy! Join In On Soccer Betting & Football Betting Action Right Now! Join Football Bets Direct Today! Since the end of the 2012 Premier League season, there has been a lot of question as to who is going to be taking over as the skipper in Anfield. Names like Fabio Capello and Louis van Gaal have been bounced around as potential bosses for the club, but these big names would figure to want to have control of all of the team affairs. Instead, it seems as though Liverpool is going to be going to more of a direct route, as the manager of the team will do just that: Manage. There doesn’t seem to be all that much wiggle room in terms of money to be spent on Liverpool transfers, and that isn’t normal, especially for the biggest clubs in Europe. 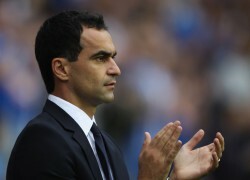 Enter: Roberto Martinez. At just 38 years old, Martinez definitely is one of the younger managers in the EPL, and he is the type of man that, if he can lock on to a job and prove to be successful, could be around for two decades. Martinez spent the majority of his playing career with Swansea City and Wigan Athletic, the two teams that he managed as well. In his first managerial stint with the Swans, Martinez was able to bring his side up to the Championship from League One by winning the league. He was largely linked to a number of different teams at the Championship level, but he always wanted to stick with Swansea. That changed when Wigan came calling in its first stint in the Premier League. Martinez jumped to his other team and has kept the squad up in the EPL ever since that point, something that was largely looked upon as impossible task. The Latics are now considered regulars in the Premier League, though that could change now that Martinez is gone. That being said though, when Martinez left Swansea, the Swans were still an up and coming team. Not only did they earn promotion to the Premier League in the 2010-11 season, but they also finished in 11th place on the Premiership table this year, ahead of Wigan. A Martinez move is expected sooner than later anyway. He has been linked to a move to Villa Park to join Aston Villa for the last two years, though at least as of this point, he has not succumbed to that move. However, the allure of the big time job with the Reds, one that could come with a huge raise, might be too much to pass up. For Liverpool though, this is a bit of a gamble. Normally, teams at the top of the ladder in the Premier League another European leagues want to invest in managers that have proven track records with winning teams. This though, would be the second straight very suspect managerial hire. Dalglish had been out of major coaching for over a decade before making his return to Anfield, and he proved to be a disappointment. Now, hiring Martinez would be on the other end of the spectrum, though it would bring a fresh, new young look to the Reds.